8 to 10 hours return, or overnight at either Frosty Creek Wilderness Campsite (Lightning Lake side) or Pacific Crest Trail Wilderness Campsite (Windy Joe side). Start of trail: Lightning Lake day-use area parking lot or Similkameen/Windy Joe/PCT parking lot. Best time to go: July to September. Late July to mid-August there are lots of wild flowers to see. About the third week of September the stand of sub-alpine Larch changes colour to gold. Well worth a hike then, especially as the days are cooler and usually sunny. With an elevation of 2423 m, Frosty Mountain is the highest mountain in the park. To reach the first and only safely accessible peak (2408 m), the hiker passes through a great variety of habitat; from lake-side forest and sub-alpine meadow to larch forest and true alpine. The Frosty Mountain trail is, for the most part, on the north-facing slope, making it one of the last trails in the park to be free of snow. Although accessible by late June, there is the possibility that the summit cannot be reached due to snow. As cornices along the ridge can be extremely dangerous, travel on them is risky. Peak flower season is generally the first two weeks of August. Prior to that, the “Spring” bloom and a variety of fungi are of interest. From mid-September through early October, the golden fall colours of the larch and vaccinium are spectacular, and the variety of fungi is extensive. LIGHTNING LAKE START: Leaving the Lightning Lake day-use area, cross the bridge over the dam on the east side of the lake. About 100 m south of the bridge, take the left fork of the trail and head up a small scree slope. trails to prevent further erosion caused by cutting corners. After about 45 minutes, you will enjoy the first of many views down to Lightning and Flash Lakes. 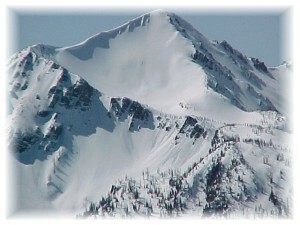 Look for Silvertip Mountain behind the ski hill and Mount Hozameen off to the southwest. The forest occasionally opens to gorgeous meadows of lupine, arnica and mountain valerian. Another good hour of walking (7 km from Lighting Lake day-use) brings the hiker to Frosty Creek wilderness campsite at 1850 m elevation. There is a shelter here for inclement weather conditions, however, come prepared, it may already be in use. A small creek runs through the campsite; when moving on be sure to fill your water bottles here. From Frosty Creek another .5 km or 30 minutes of steep trail leads to the Larch grove. The forest opens slightly during this ascent to expose a scree slope sprinkled with plants such as Lance-leafed Stonecrop. Note how its fleshy leaves hold much needed moisture for the plant. The views continue to be spectacular. Half a kilometre into thelarch grove, the grade of the trail lessens. Undergrowth has shrunk in size; pussytoes, partridge foot, red heather, wood rush and other small, hardy plants thrive here. Alpine larch are truly beautiful, especially in fall against the magnificent backdrop of Frosty Mountain’s westerly peak. At approximately 10 km, both peaks of Frosty Mountain loom ahead. The larch forest suddenly ends, and a much more austere habitat begins. The scree slope is dotted with multi-coloured crustose lichen. Cushion plants, such as moss campion and whitlow grass cling to the rock, keeping low and out of the dry wind. These plants take years to establish themselves; please take care not to step on them when scrambling up the rocks. Pika can be heard peeping out warnings to one another, and are sometimes seen scurrying from boulder to boulder. In August, look overhead for raptors such as the sharpshinned hawk. 1.5 km of steep switchbacks lead to the ridge and to the junction with the Windy Joe side of the trail. Those with overnight packs may prefer to leave most of their gear at the junction before ascending the last .6 km along the ridge to the summit. The scree slope on Windy Joe (eastern) side of the ridge is not as steep as the western slope. After about half an hour, the rock slope merges into a meadow resplendent with Western anemone, red and white paintbrush, wood betony and lupine. The flowers tend to bloom a little later here than on the western slope. From the meadow, the views continue to be breathtaking. The forest gradually thickens after 14 km. At 19 km, the junction of the Pacific Crest Trail is reached. Those who want to spend another night in the forest should turn right and proceed about 200 m to the Pacific Crest wilderness campsite. No shelter is provided here but there is an outhouse and a good water source. The gentle stream that flows through the camp is the first on this side of the mountain. Those continuing down will encounter another stream nearby. Head west along the Similkameen trail at about the 24.3 km point. Follow this route to the Gibson Pass Road and then continue along the Little Muddy trail (which loosely parallels the road) to the Lightning Lake Day Use area parking lot. WINDY JOE START: Starting at the Windy Joe/PCT/Canyon Nature Trail parking lot (located 1 km down the Gibson Pass/Lightning Lake Road), head southwest down the Similkameen Trail until its junction with Windy Joe, at just over 2 km. Turn right at this intersection and follow Windy Joe to 5.5 km where the trail will again junction off. Branch off onto the trail to the right (marked Pacific Crest Camp/Frosty Mountain). Approximately 1 km beyond is yet another junction. Stay to the right and begin the ascent to the summit. At about 10 km, the forest starts to thin to what in the summer is a lovely meadow area with lots of wild flowers blooming from late July to mid-August. After the meadows, the ascent becomes steeper as you climb along a scree slope. 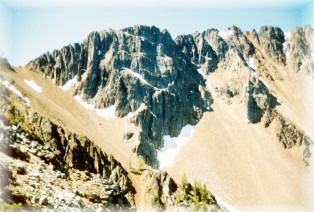 Remember to use caution when hiking along this rock scramble on either side of the summit. The summit is reached at 13.5 km and a further .6 km will take you to the peak of Frosty Mountain. The descent is through a steep, rocky scree slope to a bowl which is nicely protected from the wind. About 1.5 km down from the summit (15 km point) you start into the Larch forest - a spectacular sight in late September once they have turned gold. Many of these trees are well over 1,000 years old, and constitute some of the oldest trees in Canada. Continue through the larch until about the 17.5 km point (this distance figure includes the scramble to the peak) when the trail re-enters the trees and begins a steeper descent to Lightning Lake. Frosty Creek wilderness campsite will be reached just over 1.5 km later (19 km). After Frosty Creek, enjoy a pleasant hike down through forest and meadow, with a number of switchbacks and occasional glimpses of Lightning and Flash Lakes, Mount Hozameen and Silvertip Mountain. Reach the Lightning Lake day-use area parking lot at 25.5 km. If doing Frosty Mountain as a loop, continue down the Little Muddy Trail (south side of the Gibson Pass Road) past 20 Minute Lake and down to the Windy Joe/PCT/Canyon Nature Trail parking lot (27.5). E. C. Manning Provincial Park - Driving Tour Page.